Mexican tiles "Amapola Blue" will do a great addition in a rustic style based rooms whether it is a kitchen, bathroom or the exteriors. 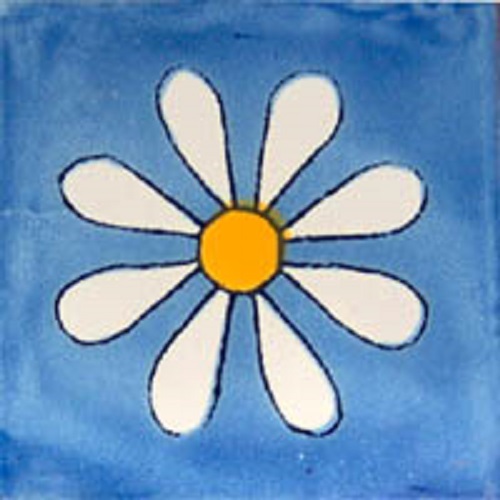 This hand-crafted ceramic tile is designed with white and yellow red clay over sky blue background. It dominates the pattern works perfectly in the bathrooms as it is considered a classic bathroom tile color and can be used as Mexican accent with many other colors, or as the main one. I purchased both this amapola talavera tile pattern as well as Mexican tiles with plain blue color. Both the design and color tiles are not solid. They look like washed with the paint and let it dry without ever using a brash. Perhaps the blue flower pattern was hand painted? In any case, Mexican tiles are rustic perfectly applicable in my country style kitchen. Region where I live there is very little Mexican tiles so anybody entering my kitchen is amazed how they look and even more amazed that I decided to buy my tiles in Mexico and then have them shipped to New Zealand.